Is snack time a challenge for you? 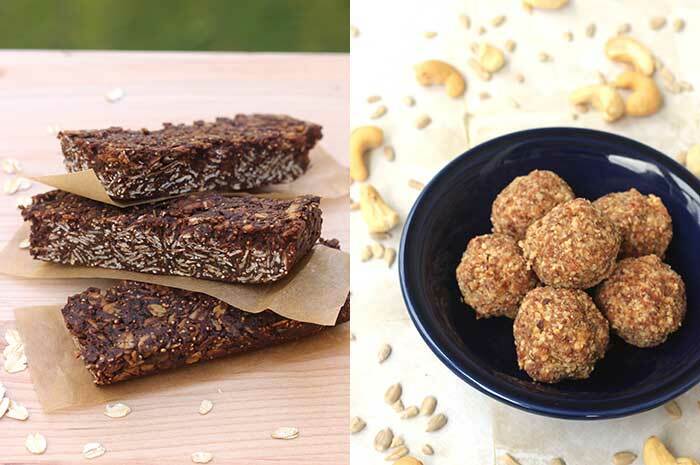 Try these unprocessed snacks – Chocolate Avocado Breakfast Bars and Energy Bites. Both are vegan and gluten-free. You may recall I’m participating in the October Unprocessed challenge. During the month of October, I pledged to avoid all processed food. Soups seem to be a good way to handle meals (see Orange Bell Pepper Soup with Roasted Broccoli), but snacks proved to be a real test of my commitment. Honestly, I’m not that much of a snacker. I do, however, seem to rely on protein bars. They are perfect after workouts and when I’m running errands or racing out the door at 8 a.m. on a Saturday morning for a soccer game. I also throw them in my backpack when I’m traveling – hunger always strikes when food isn’t easily accessible. The protein bars I like do NOT pass the October Unprocessed kitchen test. Bars that do are usually way too sweet for me or they involve peanut butter (blech). My mission was to find easily portable unprocessed snacks, e.g. protein bar replacements. The first recipe I tried was Cooking on the Weekends’ Chocolate Avocado Breakfast Bars. Containing oats, almond meal, coconut, dark chocolate, and avocado, they were delicious and filling. I also had my first experience popping amaranth (see video on Instagram). Who knew you could do such a thing?! I love dark chocolate, but not for breakfast. The bars worked very well for me later in the day. If you’re vegan, you’ll need to replace the honey in these bars with a vegan-friendly sweetener. I used coconut chips instead of shredded coconut and they burned a little. I think next time I’ll add in the coconut when there’s about 5 minutes of oven time left. One small avocado instead of half a large one works fine. That way you won’t have an avocado half left over to turn brown in your refrigerator. 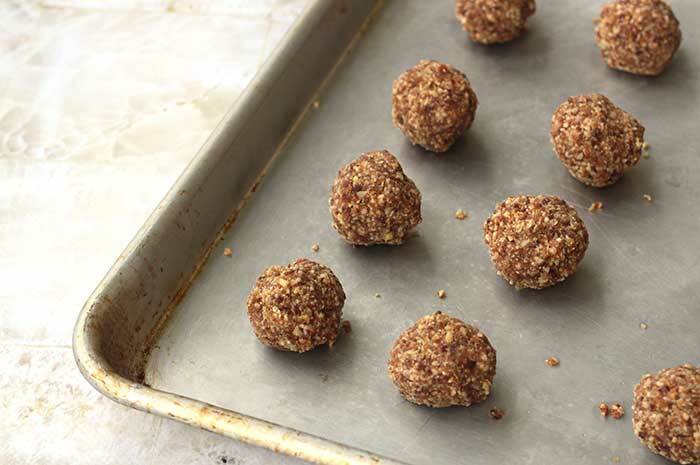 The next recipe I tried in my quest for unprocessed snacks was Clean Eating Kitchen’s Energy Bites. The nice thing about this recipe is that it’s totally flexible. You can use whatever nuts, seeds, gluten-free flour, or type of oats you have on hand. My specific energy bite combination was 1 cup cashews, 1/2 cup sunflower seeds, 1/2 cup coconut flour, 10 dates, 1/4 cup coconut oil, and 2 teaspoons cinnamon. 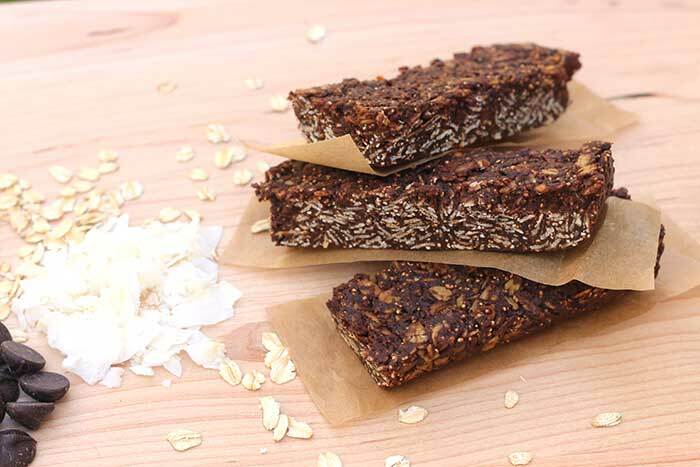 This protein bar replacement was tasty and not too sweet – just the way I like it! The recipe calls for 1 to 2 tablespoons coconut oil, but my energy bites didn’t hold together until I added more. Start with the minimum amount and add more if necessary. I used a 1 ¼-inch cookie dough scoop and got 24 energy bites. Next time I’ll use rolled oats instead of the coconut flour, but since I had just made the Chocolate Avocado Breakfast Bars and they had oats, I decided to try something different. These sound wonderful. I will have to try them. I make something similar but I add either chocolate or vanilla vegan gluten free protein powder to increase the protein, along with flax to increase fiber to avoid the sugar spike. I was pre diabetic and I am not not. I am no longer insulin resistant. Some basic lifestyle changes have allowed me to loose 30 lbs and I feel wonderful and have lots of energy. Janelle – Good for you! I have yet to find a protein powder I like (and I hate having to buy a giant container to try one). Please share which ones you like.